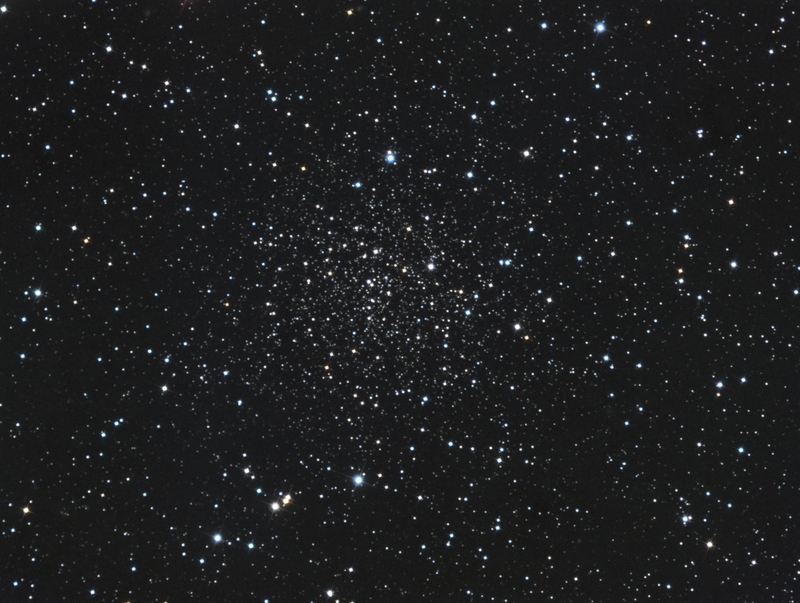 NGC 6791 is a compact and concentrated open star cluster in Lyra. The stars in the cluster have a high iron/hydrogen ratio, which is considered quite 'metal-rich'. It has an apparent size of 16 arc minutes and lies at a distance of 13,300 light years from Earth. What attracted me to this object is its similarity in appearance to a sparse globular cluster. By this I mean it is round in shape and has a fairly high density of evenly-spaced stars. As with star images, I have been gathering separate high-resolution Red, Green, and Blue subimages and combining them to form the color result without the use of a Luminance frame. Exposure: RGB: R:7x5 min, G:8x2.5 min, B:8x7 min for a total of 1.9 hrs.